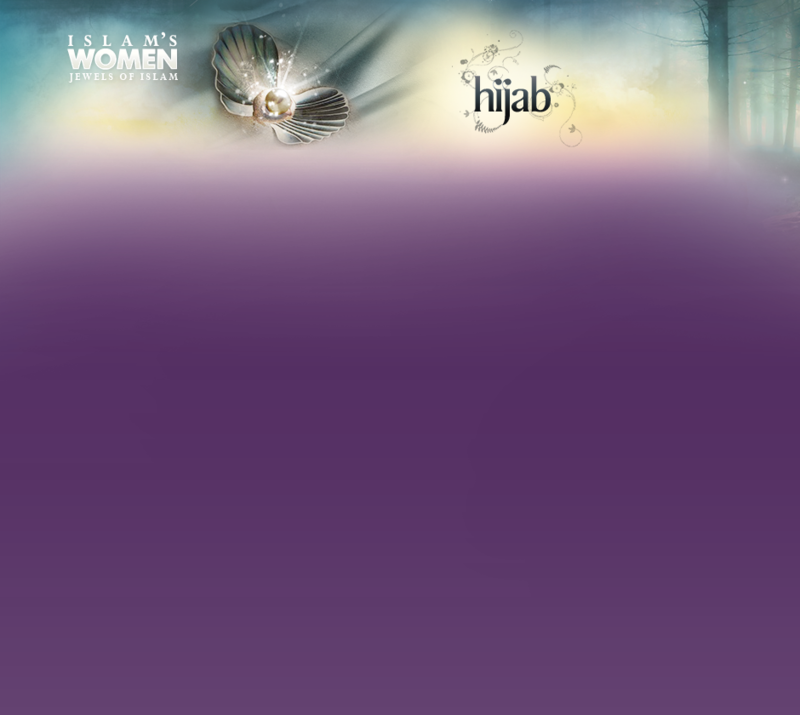 Hijab - What is it? The society around her is corrupt where men do not lower their gaze, then it is prohibited for her to uncover her face and hands. "When the verse was revealed that they should cast their outer garments over their bodies' was revealed, the women of Ansar came out as if they had crows over their heads by wearing outer garments. "And not show of their adornment except only that which is apparent." [Noble Quran 24:31]. "And stay in your houses and do not display yourselves like that of the times of ignorance." [Noble Quran 33:33]. It is in no way logical that the hijab itself be a source of display. "In the latest part of my Ummah (nation of Muslims) there shall be women who would be naked in spite of being dressed, they have their hair high like the humps of the Bukht camel, curse them, for they are cursed. They will not enter Al-Jannah and would not even perceive its odor, although it's fragrance can be perceived from a distance of 500 years traveling by camel"
This indicates that a woman could cause herself a grave and destructive sin if she puts on a garment that is thin and transparent and which clearly shapes her body's features. 4. Hijab must be roomy, and not tight. The hijab is a safeguard against fitnah. If it is tight, it will be descriptive of the woman's body and this violates and defeats the whole purpose of hijab. "Any woman who perfumes herself and passes by some people that they smell her scent, then she is a Zaniyah (adulteress)." "Women who assume the manners of men are not from us and also those of men who assume the manners of women." Abu Hurairah narrated that: "The Prophet (peace and blessings be upon him) CURSED the man who wears the dress of a woman and the woman who wears the dress of a man." "The one who take the similitude (manner) of a certain people, then he/she becomes one of them." Abdullah bin Umar said: "The Prophet (peace and blessings be upon him) saw me wearing two garments dyed in saffron (orange), whereupon he said: these are the clothes (usually worn) by the Kuffar, so do not wear them." "The one who wears a garment designed for a worldly fame, Allah will make them wear a garment of humility on the Day Of Resurrection then he will be set ablaze." The garment of fame is any garment a person wears to make themselves look famous. This applies whether the garment is highly precious and shows admiration to the life of this world or if it is chosen of a low quality to show lack of interest to this worldly life. The person may put on clothes with distinct colors so as to draw attention, act proudly and/or arrogantly. Examining the various conditions about the hijab one can clearly recognize that many of the young Muslim women are not fulfilling these conditions. Many just take "half-way" measures, which not only mocks the community in which she lives, but also mocks the commands of Allah. They consider what they put on now wrongly as "hijab" So, O Muslims, be mindful to Allah and His Messenger (peace and blessings be upon him), and do not deceived by those who "bless" this action of yours and conceal their true intentions. Do not be deceived, and there is no excuse to follow the evil.